This set has an A & J beater with a patent date of 1923 on a Hazel Atlas four cup green measuring pitcher. The beater has a rare dribble cup mounted on the splash guard that allows you to slowly add oil in a thin, steady stream to make an emulsion (as in making mayonnaise). The pitcher is marked both A&J and H over A for Hazel Atlas on the base. There is some very minor paint loss and cracking of the paint on the top knob and some discoloration on the beater blades and inside and around the base of the dribble cup. There is also a small popped air bubble on the base edge that I checked with a magnifying glass to verify that it was from when it was made rather than a chip. This set features an A&J four cup beater pitcher and a matching A&J Beater. The beater top knob has very good paint on the handle and some light pitting on the top of the cover. The glass cup is in very good condition with no chips or cracks and just some minor markings on the inner high points where the beater blades have rubbed against the inside edge. The beater pitcher is marked on the base with A&J in a diamond and "Patent applied for" below that. The beater is embossed with A&J and a 1923 patent date on the wheel. This set has a Merry Whirl beater on a red stripe measuring cup that I suspect was made by Hocking. The paint on the knob of the beater has some chipping and paint loss (The paint on these beaters doesn't seem to hold up as well as the A&J beaters). There are no chips or cracks in the milk glass measuring cup which is embossed with measure marks up to 4 cups. The beater is embossed on the wheel with a patent date of 11/28/16 along with Merry Whirl and Made in the USA. This is a rare four cup marked on the base T & S Handimaid measuring pitcher and a green handled beater. Handimaid four cup pitchers are much more rare than the two cup and the green is rarer still. The metal parts have some light surface rust spots mostly on the top of the splash guard and the wooden knob has paint loss around the base. The pitcher does have a chip on the underside of the foot which is shown in the last few pictures but the rest of the glass is chip free. 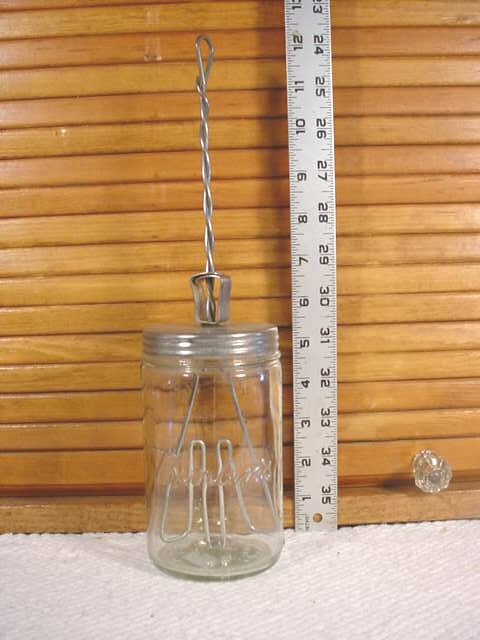 This is a two cup green glass T&S HandiMaid measuring cup and beater combination. Both pieces are marked with the beater having "T&S" and "Made in USA" on the wheel and the cup is embossed in the base with "T&S HandiMaid made in USA". The metal parts have some wear to the finish and the wooden knob has paint loss. The two cup measuring cup is in great shape with no chips or cracks. This is a four cup clear beater jar marked A&J on the base with an A&J beater featuring white and blue paint on the wooden parts. The large wooden knob is in good shape and the smaller knob has some paint loss on the ends. There are some beater marks from use on the interior of the jar and some minor chipping on the inside rim. A hard to find A&J "Whirlpool Whipper" and bowl combination this was made specifically for making whipped cream. The metal bar and spring beater rotate around inside the bowl so it "Stirs as it Beats as it Whips". There are a few small areas at the top and around the beater spring area with some surface rust starting and a small dent in the base, but it would clean up very easily and be ready to use again. This is a four cup pitcher that is marked on the base A&J / Ekco and a red handled A&J beater with a 1923 Patent date on the wheel along with a stippled splash guard. The splash guard of the beater sits on a rim inside the pitcher and the beater itself works smoothly. This set is in good shape with good paint on the handle of the beater and some small chips on either side of the inner rim of the pitcher about an inch back from the spout. This is a rare stippled two cup beater jar with an A&J beater. There is some very minor paint loss on the handle and some minor rust/pitting on the metal parts of the beater. There are no chips or cracks in the beater jar. This is a metal handled A&J beater on what I have always called the pineapple beater bowl. There are some minor chips on the feet of the bowl, and the beater handle originally was covered with white paint which has for the most part worn off. There is some minor rust/pitting on the metal parts of the beater. This is a two cup marked on the base A&J / Ekco measuring pitcher and a red handled A&J beater with a stippled splash guard. This set looks barely used with great paint on the handle of the beater and very minimal wear on both the measuring pitcher and beater. A very hard to find beater by Silver & Co. New York which is embossed on the base of the beater along with Patd. APL.30-78 and MAY 11-86. It stands just about 11" tall and has two paddles at the base of the handle for mixing. The jar is free from chips or cracks and is heavily embossed with wet and dry measurements along with sayings such as 10 whole eggs make one pint. The only markings on this 8" "Rapid Fire" beater is the patent date of Jan 6, 1920 that is located around the mixer hole. The glass has panels on the sides and it originally had a paper label that is long gone. The glass is in good shape with no chips or cracks and the metal lid and beater discs have some very minor corrosion. This 8" beater is unmarked other than around the mixer hole where it is marked "patent applied for". It is similar to the "Rapid Fire" beater above but is smooth sided rather than paneled. I cannot identify a manufacturer. The glass has no chips or cracks and the metal parts have some very minor corrosion. Archimedean drill style mixers work with a screw type action when the handle is moved up and down. 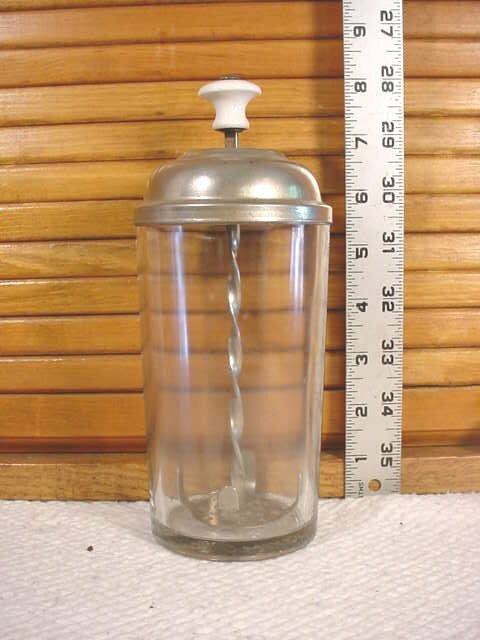 This is an Archimedes style mixer that is embossed "Bordens" on the front of the glass and had measure marks 2 - 14 oz on the back along with 1/4, 1/2, and 3/4 pints. It is embossed with a patent date of March 30th 1915 on the base. . The glass is in great shape with no chips or cracks. This is an Archimedes style mixer that is embossed on the base with a patent date of March 30th 1915 along with an intermingled monogram of "AD", and assigned to the canned milk people, Bordens Milk. 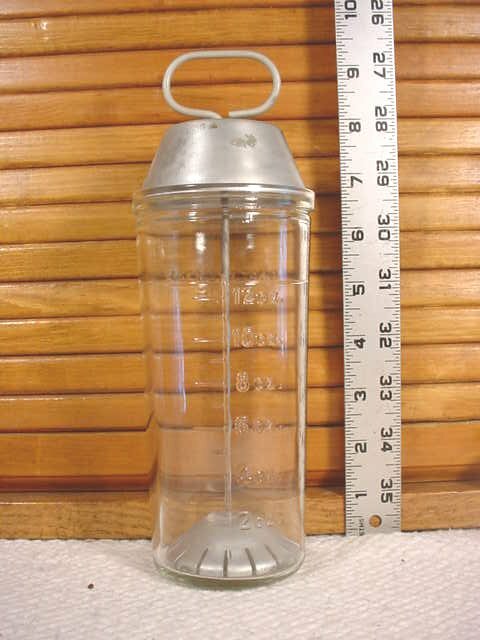 It has measure marks in 1/4 cup increments up to two cups and also measure marks in ounces. It has one small chip on the inner rim of the glass jar. 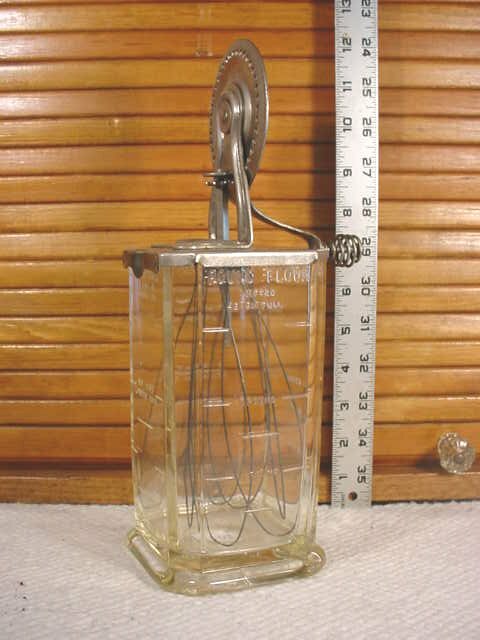 A rare, larger 10" version of a Roberts Lightning Mixer which is embossed on the base of the glass. It has a ceramic knob and there is some minor tarnish on the metal top. No cracks or chips on the glass itself . 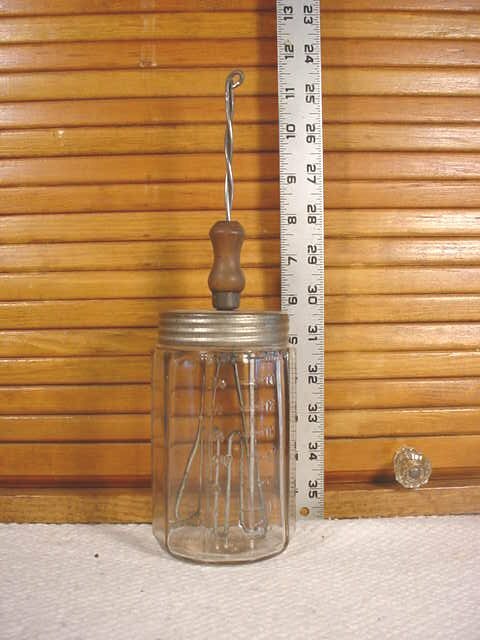 An early A&J beater that is unmarked except for the "Pat Oct. 15 07" on the metal cup that is crimped to the wooden handle. The crimped cup is loose and has about 1/8 of an inch play in it but it does not slip off the handle. The beater rotates and compresses a spring in the handle as you push down, it returns and rotates in the opposite direction when released. A beater and container made by Silver & Co. of Brooklyn NY. This beater is in original un-restored condition with some flaking of the original finish and some surface rust that should clean up nicely. The jar is without chips or cracks and is marked on all four sides with different measurement marks ("Pound Flour; Liquid Weights; Even Full1 Qt. or 4 standard measuring cups; Even Full 8 T cups or 4 coffee cups.") The handle turns freely without binding but the knob itself has a few small dings in it and one of the beater wires has broken where it bends at the base. This is a "New Keystone Beater" marked Culinary Utilities Co of New York, N.Y. and Bloomfield, N.J. on the metal apron and embossed on the base of the jar. It was patented on March 27 1917. The sides of the jar are marked: "Pound Flour; Liquid Weights; Even Full1 Qt. or 4 standard measuring cups; Even Full 8 T cups or 4 coffee cups." There is a shallow chip on one of the bottom corners about 2" long and some minor chipping on the inner rim. The handle moves freely and all of the beater wires are present and in good shape. This is a Wesson Oil crock with a matching blue A&J beater with splash guard/cover. The beater has some pitting mostly on the top plate but is in overall good condition with just about all it's original paint on the handle. The crock has some small air bubbles that burst during firing above the label and a thin sliver type chip on the base. Originally manufactured as the Simset Food Mixer and advertised as "It beats, it mixes, it whips", this beater is a little outside the age range that I usually deal with, but it was unusual enough to peak my interest. First made in 1939 and priced at $2.95 it was later manufactured by the Yoder Manufacturing Co. and was re-priced at $5.95 (quite a hefty sum in the 1940's). It has all three of it's original attachments that snap in and out of the beater handle assembly which is made of metal with either bakelite or an early plastic used on the handles. 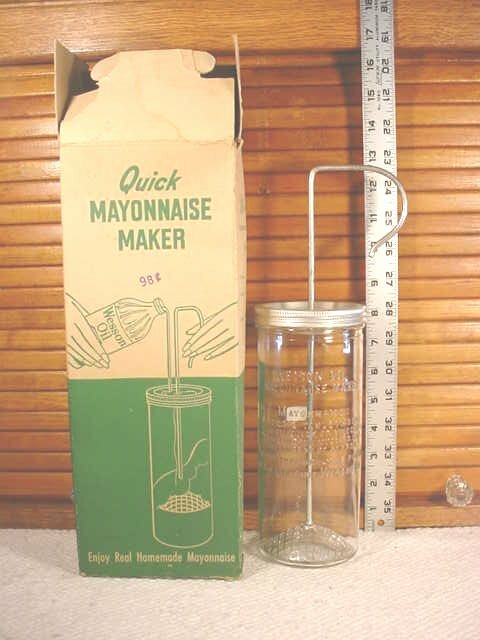 This is a Wesson Oil Quick Mayonnaise Maker with the original 98¢ ink stamp right on the front of the original box. I don't believe that this one was ever used and looks brand new except for one minor rust spot of 1/4" on the mixing cage. The instructions for making mayonnaise are embossed right on the glass so you can't lose them. These do work quite well as I found out one night when we ran out of mayonnaise and were unable to get to the store. 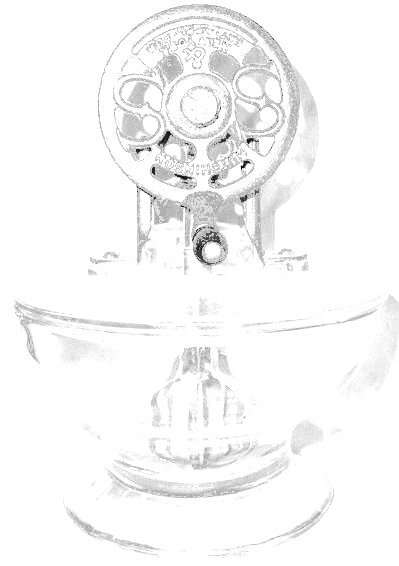 This is a Hazel Atlas Malted Milk Mixer that is embossed in the base of the glass with the "H" over "A" mark and on the top with "Malted Milk Mixer". On the side, the jar is marked in ounces up to 12 and "Do not fill above this line". This mixer dates from the 1930's and is in great shape.